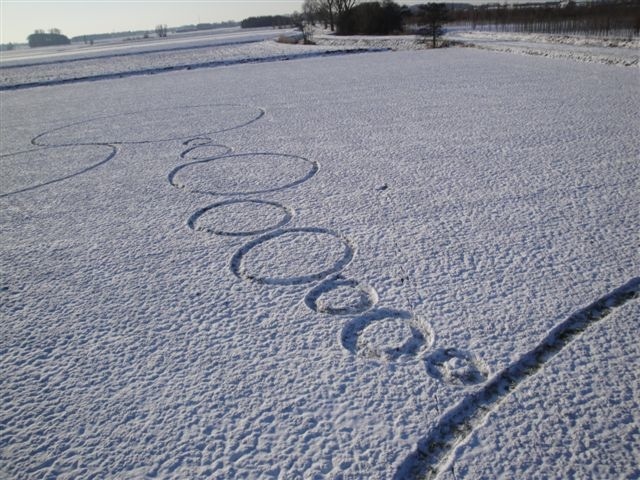 A 60m x 52m snow formation, made up of 23 rings of various diameters, was found on December 19th near Hoeven, Holland. At around 11:30pm (Netherlands time) on the night of December 17th I had called the young Dutch medium Robbert van den Broeke in Holland, and we talked until about 1:30 ­ 2:00 am (Netherlands time) about various things. Toward the end of our conversation Robbert said he felt that some circles might be coming in the snow...and I got the impression, based on my past experiences with Robbert (http://www.bltresearch.com/robbert/php), that this was likely to occur before Christmas. The next evening (Friday, Dec. 18th) at around midnight Robbert got a very strong feeling that a formation was arriving at a field not too far from his home which we call the "special" field (because so many anomalous events have occurred there over the years). He telephoned a local friend, Ellen Gomis, to ask if she would drive him to the field to see if there was a new circle present, and Ellen agreed. It was very cold and there were several inches of snow on the ground. When they arrived at around 1:00 am (Saturday, Dec. 19th) Robbert immediately felt what he described to me as a quiet, very still, "holy" feeling and heard what he could best describe as a choir of "angels" singing. I asked Robbert if Ellen heard this, too, but he said "no"-it was only he who heard the "singing." 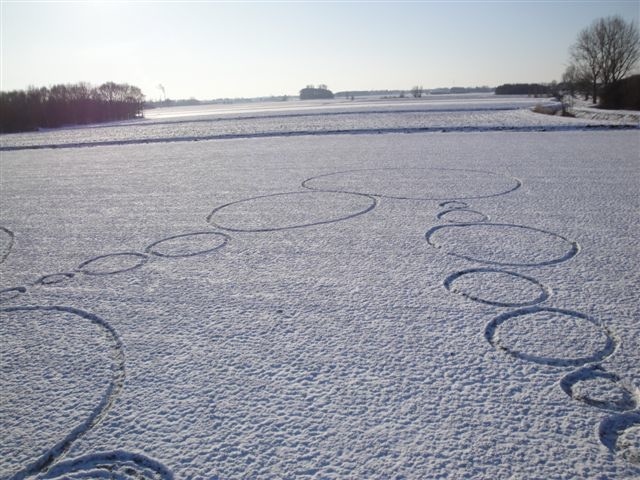 As they walked down from the dike both Ellen and Robbert saw multiple rings which had been scooped out of the snow-covered field. Note that the snow which has been removed to create the rings is not piled up around the edges-it is simply missing altogether. Because it was dark, and very very cold, Robbert and Ellen did not stay long to inspect the field. The next day (Saturday, December 19th) Robbert and Roy Boschman returned and could then see the entire formation-but Robbert is not certain that all of the rings were present the night before. He thinks that perhaps more rings were added after he and Ellen left late Friday night. the rings is not piled up around the edges. Photo: Roy Boschman. When Roy and Robbert got to the field in daylight on the 19th no footsteps were visible except near the edges of the formation closest to the dike, where Robbert and Ellen had walked the night before. There were no footprints at all out in the rest of the field, or in any of the rings farther out in the field. 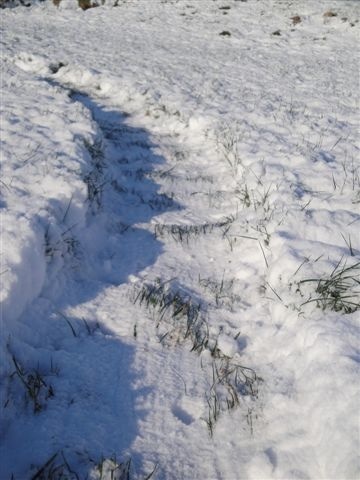 And there were also no piles of the snow which had apparently been removed anywhere in the field. No footprints were found anywhere in the field, other than those near the dike where Robbert and Ellen had stood the night before. 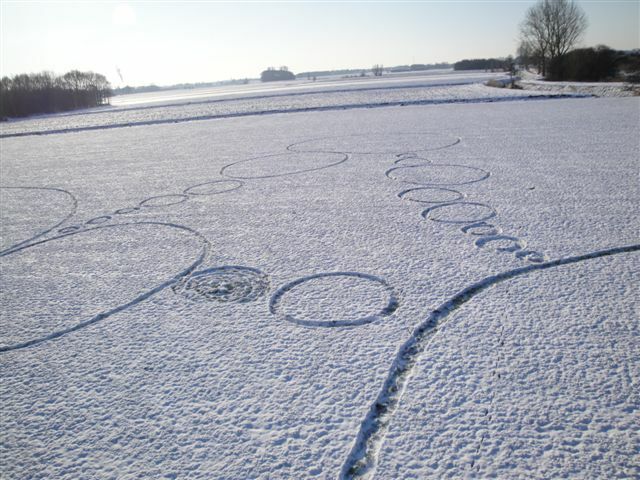 Roy Boschman's diagram of 23-ring snow formation, Dec. 19, 2009. 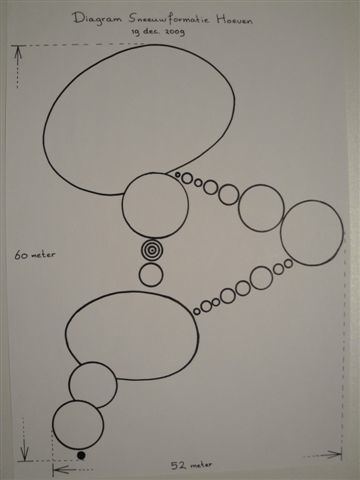 It is Roy's impression that the two largest rings were elliptical, as indicated in his diagram, above. Roy also noted the extreme cold of the previous night (during which the rings appeared), the lack of footprints, and the fact that the "missing" snow is not piled up anywhere in, or anywhere near, the formation-all of which seem to rule out mechanical creation of the rings. A more detailed report, with additional photos, will be posted on the BLT Research Team's web-site (http://www.bltresearch.com) shortly.